Andrew Lloyd Webber’s sequel to his long-running Broadway show “The Phantom of the Opera” is currently staged at Hartford’s Bushnell. “Love Never Dies” has been performed in London and the U.S. but has yet to make its debut on Broadway. The elephant in the room begs the question - why? One reason may be that “Phantom” has played on Broadway since 1987; if it’s not broken, don’t fix it. Another may be that what can possibly top the original’s spectacle including ghostly apparitions in mirrors, an illuminated underground lake among the catacombs, and of course the thrilling first act’s conclusion with the titular character’s entrance on a swinging chandelier. Then, of course is the show’s score. 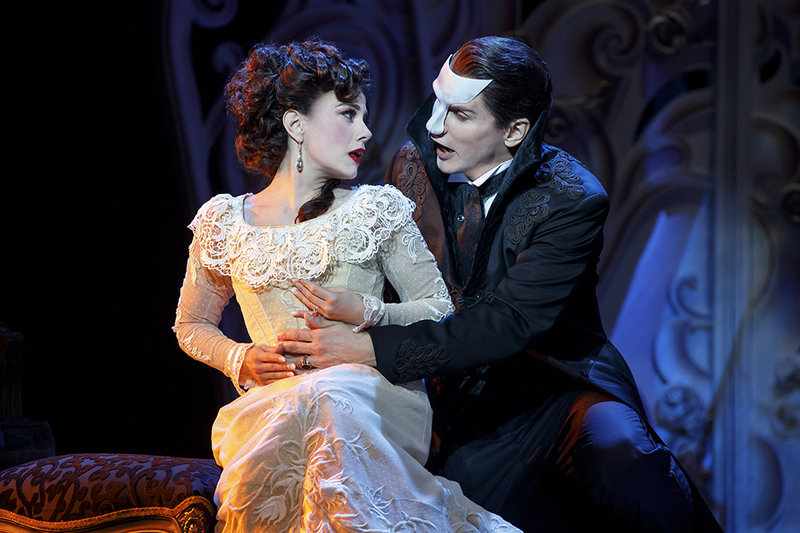 Phantom’s music includes such hits as Think of Me, The Music of the Night, All I Ask of You, Masquerade, and the title tune. In contrast, “Love Never Dies” has fewer memorable songs, in fact, only three come to mind: Look with Your Heart, Until I Hear You Sing, and the title song. Nonetheless, the score was captivatingly sung at Tuesday’s opening night by its ensemble principals and cast of approximately thirty. “Love Never Dies” begins 10 years after the conclusion of “Phantom.” The setting has changed from the gothic Paris Opera House to the gaudy Coney Island Amusement Park. The theater at Coney Island is presided over by the still love-lorn Phantom (Gardar Thor Cortes), who invites his long-ago protégé Christine Daae (Meghan Picerno) to come and sing his music at the Phantasma, his Coney Island lair, under the pretense of being Oscar Hammerstein. Christine, now penniless, yet still elegantly beautiful, arrives with her alcoholic husband Raoul (Sean Thompson) and her angelically voiced son Gustave (Christian Harmston). Intrigue after intrigue ensues, concocted mostly by the reptilian Madame Giry (Karen Mason) and her deceptively buoyant daughter Meg (Mary Michael Patterson). Like its predecessor, the secret to “Love Never Dies” (moderate) success lies in its awe-inspiring spectacle. The revolving set, compactly designed by Gabriela Tylesova, includes moments of awe, beauty, and terror: the Phantom’s jarring entrance through the double doors into Christine’s hotel room; the gilded, ghostly frames of the circus-like Fantasma (which is framed by the gaping-wide mouth of a gigantic Phantom; and the red, purple, brown, black and blue capes, gowns, hats, and jackets with ruffles in satin velvet (also designed by Tylesova). One image will never die from this reviewer’s mind: the title song melodically sung by Picerno decked in a sprawling green gown with a backdrop full of oversize peacock quills, dazzlingly lit by lighting designer Nick Schlieper. Indeed, this lilting aria earned Picerno an ovation lasting nearly two minutes. That alone, spells success.